The ‘079 patent is designed to help the monotonous tendencies of RPG attack battles. In past RPG games, a player’s character had a choice of two kinds of battle attacks (indirect and direct attacks). A direct attack would be something physical like a sword, while an indirect attack would involve things outside of the player (magic, for example). In earlier RPG games, a player would attempt a direct or indirect attacked based on whether the enemy was within range to receive the attack. If the enemy were within range, the player’s attack would succeed. The present invention seeks to enhance the player’s gameplay by allowing for certain factors to prevent the attack from succeeding. 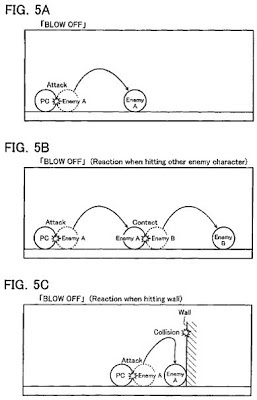 Under this invention the player must now take into account the speed of the enemy, the enemy’s skill/moves set, and the distance between the two characters. Specification of an attack for a player character is received by means of an attack specifying operation of the player. A direct attack reaction is determined in the case where it is determined that the attack hits an enemy character A. The direct attack reaction indicates a reaction of the direct attack target character that suffers the direct attack. The enemy character A is then caused to execute the determined direct attack reaction. In the case where it is determined that an indirect attack to be caused by contact between the enemy characters A, B hits an enemy character B when the enemy character A executes the direct attack reaction, an indirect attack reaction indicating a reaction of the enemy character B that suffers the indirect attack is determined. The enemy character B is then caused to execute the determined indirect attack reaction. 1. A video game processing apparatus that causes an image display apparatus to display a player character on an image display screen of the image display apparatus, the video game processing apparatus controlling progress of the video game by controlling an action of the player character to be displayed on the image display screen in accordance with operations by a player, the video game processing apparatus comprising: an attack specifying receiver that receives specification of an attack for the player character by an attack specifying operation of the player; a direct attack hit determiner that determines whether the attack from the player character hits a direct attack target enemy character movable on a field in the video game, when the attack specifying receiver receives the attack specification; a direct attack reaction determiner that determines a direct attack reaction in accordance with direct reaction determination information including attack content of the player character, a kind of ground level in a battle field where a battle is executed, and a weight preliminarily set as a weight of the direct attack target enemy character, when the direct attack hit determiner determines that the attack hits the direct attack target enemy character, the direct attack reaction indicating a reaction of the direct attack target enemy character that suffers the direct attack; a direct attack reaction executor that causes the direct attack target enemy character to execute the direct attack reaction determined by the direct attack reaction determiner; an indirect attack hit determiner that determines whether an indirect attack hits an indirect attack target enemy character other than the direct attack target enemy character when the direct attack target enemy character executes the direct attack reaction by the direct attack reaction executer, the indirect attack being caused by contact between the direct attack target enemy character and the indirect attack target enemy character movable on the field; an indirect attack reaction determiner that determines an indirect attack reaction when the indirect attack hit determiner determines that the indirect attack hits the indirect attack target enemy character, the indirect attack reaction indicating a reaction of the indirect attack target enemy character that suffers the indirect attack; and an indirect attack reaction executor that causes the indirect attack target enemy character to execute the indirect attack reaction determined by the indirect attack reaction determiner, wherein the direct attack target enemy character is a non-player character. Wi-Fi Patent Dispute Update: Bandspeed v. Sony, et. al.